This sentiment was spot on, as “Annihilation” is a complex, intellectually challenging film that looks to reshape the science fiction genre. Based on Jeff VanderMeer’s 2014 novel of the same name, “Annihilation” is centered on a team of five scientists tasked with entering “the Shimmer,” a mysterious bubble-like structure that has been slowly engulfing an area along the shoreline of a national park. The military has already attempted numerous expeditions, with seemingly no survivors. Enter Lena, played by Natalie Portman, a biologist whose husband, played by Oscar Isaac, has disappeared on an expedition into the Shimmer, only to mysteriously appear back home a year later. Motivated to find the cause of her husband’s disappearance and hopefully save his life from an unknown illness that has befallen him, Lena volunteers to join the team of women who are about to head into the Shimmer. The nature of the Shimmer draws a striking comparison to the Monolith from “2001: A Space Odyssey” — Stanley Kubrick’s 1968 masterpiece about a space crew investigating an extraterrestrial object. In “2001,” the presence of the Monolith indicates a drastic leap in human evolution, as seen early in the film, where a group of apes encounters a Monolith and subsequently learns to use tools. In “Annihilation,” the Shimmer also creates great change, as the whole area enclosed by the Shimmer is filled with mutated, distorted organisms. The film as a whole exudes a Kubrick-like perfectionism, clearly flowing from Garland. Building on the stunning brilliance and intellectual depth of “Ex Machina” (2014), here Garland engraves his signature style with a refinement quite rare for someone who has only directed one film prior. Chief among Garland’s trademarks is the visual wonder of the film — the gorgeous special effects and cinematography in “Annihilation” bathe the viewer in luminescent color and sleek reflections. Aided by a simple yet powerful score, Annihilation uses this intense sound in contrast with the deliberate confusion of perception. When comparing the meticulous and immersive environment of “2001” to that of “Annihilation,” one cannot help but imagine that they are getting a glimpse at what the famed director would have done if he had access to the technology of the present. The similarities between Garland and Kubrick show promise but also reveal flaws in “Annihilation” where the film deviates from its course toward brilliance. Among heavy intellectual concepts and jaw-dropping effects, it’s easy to miss the weaknesses of the narrative — but the plot of “Annihilation” has fundamental flaws that cannot be fully obscured by even the dense forest of the Shimmer. 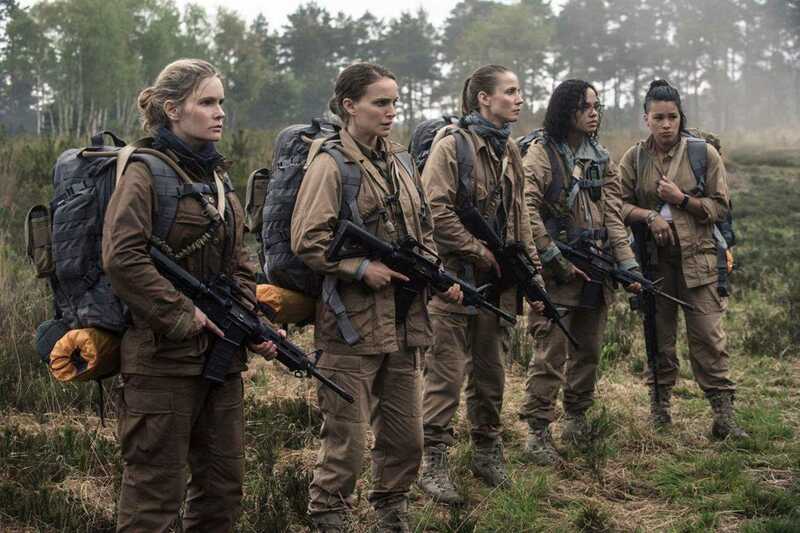 “Annihilation” unfortunately bogs down the narrative with more basic plot elements. The mutated beasts of the Shimmer, seen extensively in the trailers, add little to the development of the narrative. Introspection is sacrificed for external tension, and with it go countless opportunities to explore the characters within the film. The film’s dialogue is surprisingly scarce. While the awesome presence of the Shimmer can explain much of the melodramatic silence early on, the main characters are all supposed to be scientists — analytic minds who would make for great, if technically unattainable, dialogue. Instead, pretentious brevity limits the development of the other characters. While poor character development and an anemic script would sour most other films, “Annihilation” weathers these issues through the sheer ambition of Garland. By tackling concepts like creation, evolution and the nature of both death and life, it would be libelous to say that Garland settles for easy filmmaking. Through his rigorous intellectual commitment and drive to push past even the most revered of conventions, Garland shows the root of his similarity to Stanley Kubrick, one that is not based on stylistic plagiarism or shallow imitation. Despite his directorial growing pains, “Annihilation” makes one thing clear — Garland understands that great science fiction is not rooted in how deep into space mankind can go, but how much mankind still has to learn about its own depths.